If you want to see an excellent demonstration of the benefits of juicing then I recommend the film Fat Sick and Nearly Dead. In the film Jo spends a month drinking/eating nothing but vegetable juice and sees massive improvements in his health. I don’t recommend an approach this extreme if you have ME/CFS. I used to struggle with blood sugar regulation (another of my symptoms that has dramatically improved) and I found I needed to eat regularly. I think I would have felt pretty awful without regular meals containing protein. Juicing helps you absorb all the nutrients from the vegetables. This is important because most of us have impaired digestion as a result of making less-than-optimal food choices over many years. This limits your body’s ability to absorb all the nutrients from the vegetables. Juicing will help to “pre-digest” them for you, so you will receive most of the nutrition, rather than having it go down the toilet. Jo Cross’s website has several recipes, or you can buy juicing recipe books. However, I find rather than following a recipe I pick a selection of what I have in my fridge, so here’s my guide, based on experimentation. Mix and match to find what suits your taste. Start off with more sweetness and slowly increase the proportions of greens. Sweetness: apple/pear/carrot/beetroot. Too much of these will increase the sugar content of your juice. Add enough to get a pleasant flavour, but don’t go overboard. Green leafy vegetables: Kale, Spinach, Parsley, Lettuce, cabbage etc. Slowly increase the quantity of these if you’re new to juicing. Added Zing: Lemon or Lime. This is particulary useful if you have added too many green leaves and the juice is a bit bitter, it cuts through that. Other vegetables: Anything you want. I like fennel, brocolli, peppers, but experiment. What type of Juicer is best? There are two main types of juicers: masticating and centrifugal. Generally, centrifugal juicers are cheaper than masticating juicers, but masticating juicers ensure more enzymes from the fruit are retained and also extract more juice from a given amount of produce. If you are new to juicing I recommend you buy a centrifugal juicer. This way if you find juicing does not suit you, you have not spent a huge amount of money. If your energy is limited (as mine was when I started) then look for one that can fit whole fruits and vegetables. It’s a huge benefit not to have to cut up your apples before you add them to the juicer. Juicers can also be bought second hand, or sometimes found on freecycle. This would be a great way to try juicing without a financial outlay. I haven’t written a post about green smoothies yet (that’s coming soon), but it seems some people question whether it’s best to juice vegetables or blend them. The answer seems to be that there are benefits to both, and I am currently including both in my diet. Juices are easy to digest, and provide a concentrated shot of micronutrients, while smoothies contain the whole vegetable/fruit, including fibre and phytonutrients found in the skin. You can also add protein and healthy fats to smoothies to provide a meal in a glass. I’ve been juicing for about 18 months now. It was something my nutritionist suggested. At the time I was struggling with adrenal fatigue, despite taking supplements. My nutritionist suggested that a vegetable juice, containing ginger, in the afternoon would give my adrenals an extra boost. I was sceptical and had a few concerns about juicing. I had tried juicing, once, several years ago when I bought a food processor with a juicing attachment. I remember the juicing process was difficult and messy and I did not enjoy drinking the resulting carrot and apple juice. After talking things through with my nutritionist, we came up with a plan; I would contact my friend Amber at LoveFit – I was pretty sure she’d have a juicer (and I was right)- and ask if she could make me a juice, letting me watch her make it and clean the juicer afterwards. I was concerned that I did not have the energy to make the juice and clean the juicer afterwards. Amber made me a carrot, apple and ginger juice, and it was surprisingly pleasant. She explained that as long as you clean the juicer immediately it’s not a lot of effort. I then bought a cheap centrifugal juicer and started juicing for myself. Initially I could only juice on my good days, and I had quite a few days where I simply didn’t have the energy to make it. Gradually though (as with most activities) it became something I managed more frequently and eventually everyday. I also slowly changed my juice until it contained more vegetables and less fruit, with a focus on green leafy vegetables. After a year of juicing consistently I splashed out on an Omega Vert Masticating Juicer. I bought this second hand on Ebay, but it was still expensive. However, this gets much more juice out of produce, especially green leafy vegetables, and apparently more enzymes are retained in the juice. I currently juice nearly every day, usually mid afternoon, and I currently get a noticeable increase in energy afterwards, which is helpful when I’m preparing dinner. I did not get this energy burst when I first started juicing, it’s a relatively recent thing, and one I’m grateful for. In my ME/CFS Awareness Day post I explained that Post Exertional Malaise (PEM) is one of my main symptoms. Since I’ve been suffering this week I thought I would share my survival strategies with you. It’s important to accept your current capabilities. When you have PEM you feel awful, and can do less activity than usual. If you try and ignore your body, push through and carry on as usual you will make the situation worse. You get PEM when your mitochondria can’t provide enough energy to meet demand and switch to anaerobic mode. It takes time for your body to process the waste products from this and produce more ATP so that you can function normally again (see Dr Myhill’s website if you want a detailed explanation of the cellular processes). In the meantime, if you push you will be forcing your mitochondria into anaerobic mode again, it will take you longer to recover and you will feel worse because you will have even more lactic acid build up. So, accept where you are, adjust your activity levels accordingly and be kind to yourself. When you have PEM the kindest thing you can do for your body is allow it to recover, the way it will do this is via rest. Have a look at what you’ve planned for the day and cancel all non-essential activities. Depending on where you are on the recovery scale this will vary. For example I used to have to arrange for someone else to take my kids to school, cook dinner, brush my hair etc. . Now because a normal day is much more active I can still manage basic self care activities like having a shower and putting dinner in the slow cooker. I cut back on activities like hanging out the washing or going to the supermarket and I do the school run on my electric bike without pedalling. The level of activity you can manage is different for everyone, it’s really important to listen to your body and not try and do things that increase your symptoms. Your body is struggling to get rid of toxins. By drinking plenty of water you will help flush everything out. For variety, or if you struggle to drink plain water, try hot water with a slice of lemon. By good food I mean food that is easy to digest and will provide plenty of nutrients. Some foods need more energy than others to digest. Your body is low on energy, so the last thing you should be doing is eating foods that need energy to process them. The same old advice applies here: plenty of vegetables, lean protein and healthy fats. Avoid sugar and refined flour products, brown rice is a great option for a carbohydrate portion. You need to make eating good food easy on bad days, so try and have some food in the freezer, or buy pre-prepared vegetables that you can eat with little or no preparation. Bags of carrot batons and salad leaves are great options for no cook vegetables. All those toxins flowing through the body are a stress on your system. Given that most people with ME/CFS have Adrenal Fatigue, it’s important to try and minimise your stress level. Meditation or guided relaxation is a great way to do this. Why can’t I just pace properly? I’m always going to feel like this. I’m never going to recover. You have to “Bounce the Boundaries” in your recovery and try doing extra activities, otherwise you will never improve. Sometimes these experiments will show you you’re not ready for that level of activity yet. It’s all part of the process. This is a temporary set back. You don’t feel like this all the time, most of the time you feel better. You will soon be back to how you used to feel and your recovery will continue. In the first months of my illness I needed my husband to point out to me that my negative thoughts were incorrect. Now, after all the practise I’ve had, I can usually quickly counteract them myself if they pop up, and they pop up a lot less than they used to. A regular focus on things in your life you are grateful can really help you feel more positive about your situation. I like to list 5 things I’m grateful for. When I’m feeling low this is sometimes a stuggle, but I can always think of 5 eventually. They don’t have to be big things. Here’s a few examples, but everyone’s list will be different. I have plenty of food to eat. The Optimum Health Clinic suggest making a first aid kit for bad days. This could include your favourite film, book, music, phone numbers of people who can cheer you up, quotations that you find helpful etc. The idea is that if you put all this stuff together on a good day, then on a bad day you’ve got a box or resources which are going to help you. If you’re well enough for a bath, then an Epsom Salt Bath can really help PEM. Bathing in Epsom Salts can ease aching muscles, help your body’s detoxification process and lower stress levels. Here’s a great post from SCD lifestyle which explains the benefits and what to do in detail. Don’t get too hung up on having the perfect bath though; it’s better to do it imperfectly than not do it at all. These are my coping strategies. Do you have any other ways to survive PEM? Please share in the comments below if you’ve got any helpful suggestions. Yesterday was ME Awareness day. Due to my ME I didn’t manage to get a post out yesterday, but better late than never. Here’s my contribution to raising awareness by trying to explain a bit about how this illness affects me. 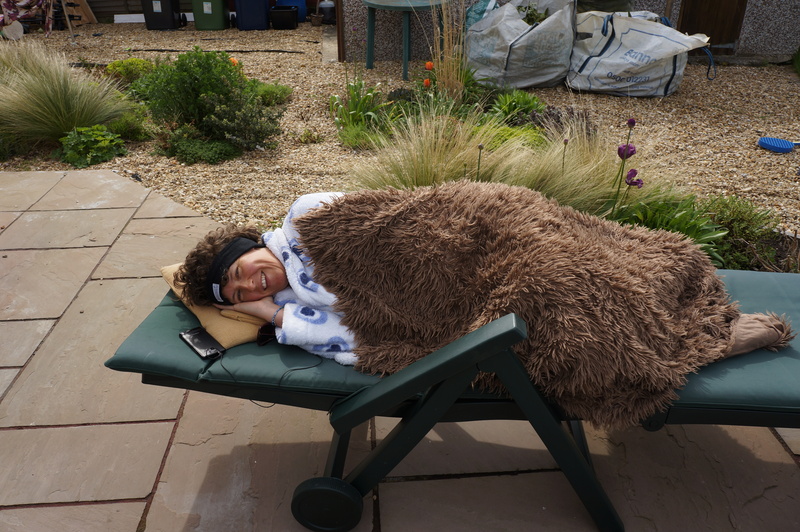 Last May I joined a group of ME sufferers in a Sponsored Pyjama Day to raise money for ME charities. I was amazed by the amount of sponsorship I received, and so made an effort to get out in public in my PJs. 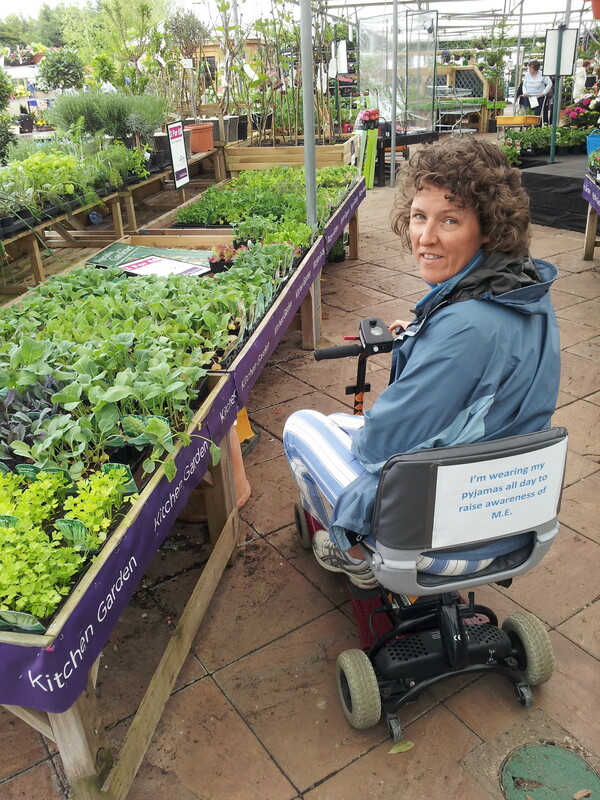 Here I am visiting the garden centre, on my mobility scooter. The only people that see me at my worst are my family, because at that point I’m too ill to go anywhere or invite people to the house. One of my main symptoms is Post Exertional Malaise (PEM). ME is not well understood by the medical profession, but it is believed PEM is caused by the mitochondria in cells not functioning properly. Mitochondria are the engines of our cells, they provide the energy for all cellular functions. We have many different cells doing different jobs in our body; brain, heart, blood, muscles etc. All these cells are powered by mitochondria, and hence if the mitochondria are not providing the energy they should , none of these cells can function properly. In an attempt to keep supplying energy, the mitochondria switch to anaerobic metabaolism. As any athlete knows this is unsustainable; it causes a build of lactic acid in the muscles, leading to pain. It can take an ME sufferer several days to recover from this, and during this time we suffer from PEM. A fuller explanation of the cellular processes that lead to PEM can be found on Dr Myhill’s website. For me, PEM feels like I’ve been poisoned, other sufferers say it feels like having the flu. I think the poisoned feeling is due to my body struggling to process the lactic acid and other cellular by products. The threshold of activity that causes PEM is rising for me, so I’m able to do much more this year than last year before I suffer. 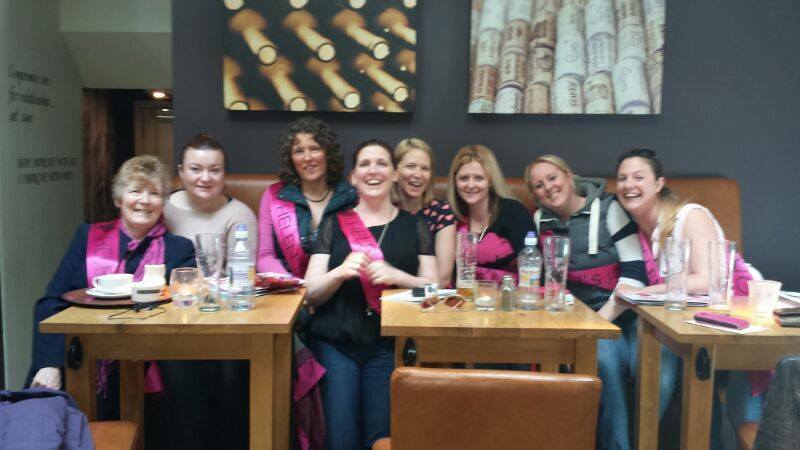 However, yesterday I was suffering (mildly compared to how things used to be) following a busy weekend at my sister’s Hen Do (picture below). It’s great to be able to join in activities like this, but I am reminded that although I can now appear relatively normal for 1 day, I can’t yet sustain it. My ME symptoms are classified as mild, but there are many sufferers who are housebound or bedbound. Action for ME have made a short (4 minute) film to raise awareness of ME. If you would like to support an ME charity then there are several main charities in the UK. Thanks for taking the time to read more about my invisible illness. Hopefully this time next year I will be talking about my ME in the past tense. If you’re at the stage in your ME/CFS when you are struggling to cook a simple meal, then please feel free to ignore this post. However, I’m trying to get from 70-80% recovered to 100%, and Kombucha is something that I’m hoping will help me. Kombucha contains lots of beneficial bacteria and yeasts and as such is supposed to be great for gut health. My nutritionist says that most of my remaining symptoms relate to digestion and absorption issues, so I’m keen to do everything I can to improve my gut health. The idea to try Kombucha did not come from my nutritionist (she’s wary of suggesting actions that require a lot of effort since I was unable to implement several recommendations in the early days), but she is supportive of my decision to try it. I have read about the benefits of Kombucha on various blogs and websites, and also in The Wahl’s Protocol. Kombucha is a fermented tea drink. It is made by making tea, with sugar, and adding a SCOBY (symbiotic culture of bacteria and yeast). The SCOBY forms a layer on top of the tea and slowly “eats” it. After 4-7 days you remove the SCOBY and bottle the liquid Kombucha. At this stage you can add fruit to flavour the Kombucha or just drink it plain. The resulting drink has a pleasant fizziness. I must stress that Kombucha does not taste like Tea. One of the reasons I didn’t try kombucha sooner is that I do not like tea, so I assumed I would not like Kombucha. Kombucha tastes more like cider (or vinegar if left too long) than tea, and in fact does have a low alcohol content (apparently about 0.5% c.f. 3-4% for beer). Since I started drinking Kombucha I have stopped taking the probiotic capsules that I’ve been taking for nearly 2 years. Kombucha is much cheaper than buying probiotics. I have followed the instruction on the Seeds of Health website. After a few run throughs I have found the most efficient way for me to bottle my kombucha and get my new batch started. These instructions are designed to be read after you’ve read the Seeds of Health instructions, and are based on you having a batch ready to bottle and wanting to start a new batch at the same time. Remove the teabags from the cooled tea and pour into the bowl. Add approx one cup of kombucha from the batch you’ve just bottled and then carefully place the SCOBY on top of the tea. Cover with a tea towel, and place somewhere where it won’t be disturbed for 4-7 days. Add any flavour that you wish to your kombucha bottles. I have experimented with a few flavours, and plan to keep trying different ones. I’ve had great success using Cherry Active Concentrate. I also made a lovely pear flavoured bottle (chopped up a pear and added it to the bottle), but I didn’t like a similarly made apple flavoured bottle. My latest experiment was lime and ginger, which I love. There are plenty of flavour ideas on the Cultures for Health Website. Apparently you can buy SCOBYs online, but I got mine via a facebook group similar to freecycle. I simply put a request for someone to let me try their Kombucha (remember I thought I wouldn’t like it because it’s made from tea), and if I liked it to give me some SCOBY. A very nice lady replied to my post and invited me round to her house to drink Kombucha, and then she gave me some SCOBY. My SCOBY is looking really strong after three brewing cycles, so if anyone local wants SCOBY I am now in a position to donate some myself. I’m really enjoying experimenting with Kombucha, and hopefully I’m experiencing lots of great health benefits. At the very least, I’m saving myself over £20 a month by getting my probiotics from kombucha rather than buying probiotic capsules.